Autumn is such a magical time of year to experience West Sussex as the leaves turn to vibrant reds and oranges and the air fills with the scent of hearty, local food and crackling bonfires. 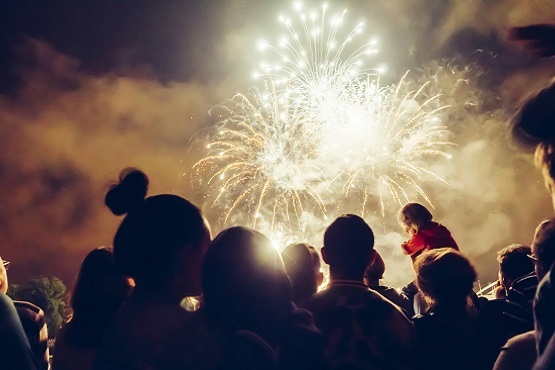 If you’re looking to visit somewhere different this Bonfire Night, we’ve listed some of the bonfire and firework events taking place around the county so that you can experience the West Sussex way of doing things. Head to the coast and experience Selsey’s magnificent firework display. The fireworks are coordinated with music to create an unforgettable experience for the eyes and ears, this year around the theme of Cops and Robbers! There will also be a roaring bonfire, live music, a fun fair and plenty of catering. Littlehampton’s bonfire celebrations attract large crowds every year. Watch illuminated floats amongst the torchlight procession and marvel at the elaborate costumes.. Join in with the children’s fancy-dress competition and of course, stay for the traditional bonfire celebration and fireworks display by the sea. The annual firework event at Horsham Sports Club has grown increasingly popular with visitors for its musically-coordinated display, vintage fairground rides and food stalls, which cover a vast array of tastes and cuisines from a traditional hog roast to Thai and fish and chips! Adults can enjoy the large beer tent and bar area, and there will be live music from a local band after the main event. The village of Cuckfield will be hosting its annual bonfire event complete with a hog roast, hot dogs, burgers and sweet baked treats. A year’s hard work will culminate in a spectacular bonfire and fireworks display, where you’ll be sure to see rows of carved pumpkins and Guy Fawkes dummies. Fontwell Racecourse is returning with its sell-out fireworks event, complete with traditional fairground rides and options to enjoy a tasty hot buffet with your own table for the evening’s entertainment. The display has been choreographed alongside some of the best pop hits in recent years to ensure your night goes out with a bang. Monday 5 November Lindfield Bonfire Society has been hosting an annual bonfire celebration for more than a century. Starting with a fancy-dress competition and a torchlight procession, you’ll head to the common as the lighting of the bonfire commences, followed by the grand firework display. A special experience for those looking to explore some local culture. Where are you going to be celebrating Bonfire Night this year? Tag us in your Tweets or Instagram posts or use the hashtag #ExperienceWestSussex to share your adventures with us!